The Swan Single Pro Fryer makes easy work of cooking freshly battered fish, tempura, fruit fritters and delicious home-made chips. With a 3-litre oil capacity that can take 1kg of food, you'll soon have delicious treats ready for all the family – and save yourself a fortune in stopping all those visits to the chippy! You can cook up to 190°C for beautifully crispy results. The stylish finish looks good and your kitchen top and the unit comes apart for easy cleaning, including dishwasher-safe oil container. A 2-year guarantee also gives you peace of mind. Read the reviews for this and somebody mentioned that you have to leave the lid off when frying - for me, I wouldn't like to use it like that. Do you think that they have got this wrong? I have had several fryers whereby the lid had to be removed whilst cooking. Read the reviews for this and somebody mentioned that you have to leave … Read the reviews for this and somebody mentioned that you have to leave the lid off when frying - for me, I wouldn't like to use it like that. Do you think that they have got this wrong? You have to leave the lid off. Bought a Morphy Richards fryer which was reduced to £20 a few years ago. This fryer looks identical and has the same speck and so is likely the same. It is a good functional fryer but all the fonts such as temperatures rubbed off very quickly after being wiped with a damp solvent free cloth although this isn't really important to me. With regards to frying with the lid on i've found that you have to keep the lid off (at least for a few minutes after putting food in) as the oil bubbles over onto the worktop (likely due to too much moisture/steam not being able to escape). One think that disappointed me was that the fryer is not suitable to cook with lard which was initially my main attraction to a 'pro' fryer. Nothing tastes quite as good as chips cooked in lard. Sizzling hot price. Heat added. Bought a Morphy Richards fryer which was reduced to £20 a few years ago. 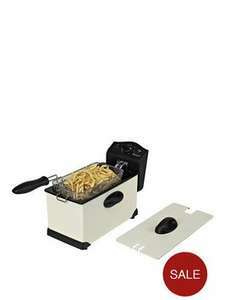 … Bought a Morphy Richards fryer which was reduced to £20 a few years ago. This fryer looks identical and has the same speck and so is likely the same. It is a good functional fryer but all the fonts such as temperatures rubbed off very quickly after being wiped with a damp solvent free cloth although this isn't really important to me.With regards to frying with the lid on i've found that you have to keep the lid off (at least for a few minutes after putting food in) as the oil bubbles over onto the worktop (likely due to too much moisture/steam not being able to escape).One think that disappointed me was that the fryer is not suitable to cook with lard which was initially my main attraction to a 'pro' fryer.Nothing tastes quite as good as chips cooked in lard.Sizzling hot price. Heat added. Lard is good, but Beef Dripping is much better. Why can't it be used with lard? These things stink the house out and make your clothes smell awful. I haven't tried, but the instructions specifically listed that in no circumatances was lard to be used. The heating element is relatively small relative to the base of the pan (it is removable from the actual pan for easier cleaning) and I suppose that to achieve the stated fry temperatures it pumps to much heat into a small area so the element would be very hot. Looking at Wikipedia I see that lard has a lower smoke/flash point in comparison to most cooking oils and so I suppose the lard may catch fire if used (The oil being liquid as opposed to solid at lower temperatures would also transfer the initial heat better). I would assume this is why. The wife works in a chippie and so I get a ready supply of free lard fried chips anyway. Note that my user picture (Tim Bergling) likely weighs half what I do. The things you enjoy in life are always bad for you.